The Geological Survey of Queensland (GSQ) is the custodian of geophysical data in Queensland and regularly collects regional geophysical data to aid exploration. Under Queensland regulations, companies that carry out a seismic survey in Queensland are required to submit their field and processed data to the Queensland Government. The data becomes open file following a 3 year confidentiality period. This data is then added to our online seismic data catalogue on QDEX Data for exploration companies to access. The data packages available online are ready to be loaded into industry software without requiring expensive or time consuming modifications. Most of the seismic data is preloaded into Kingdom projects. To access open file seismic data, visit QDEX Data or contact GSQ (see details below). The below image shows seismic coverage of Queensland. Airborne geophysical data includes magnetic, radiometric, electromagnetic and gravity data. GSQ conducts regional airborne surveys to provide publicly available precompetitive data to explorers to encourage exploration investment in Queensland. The data is also useful for some land use study applications. Queensland Government funded surveys usually involve collecting magnetic and radiometric data with 400m line spacing or better. GSQ is also the custodian of data from similar small-scale surveys conducted by the exploration industry who are required by law to submit all airborne geophysical data to the Department of Natural Resources, Mines and Energy (DNRME) within one year of acquiring the data. Once the data is made publicly available it can be obtained from the GSQ. Information about data submission requirements and confidentiality periods for geophysical surveys can be found in the Mineral Resources Act 1989, the Petroleum and Gas (Production and Safety) Act 2004, the Geothermal Energy Act 2010 and the Greenhouse Gas Storage Act 2009. 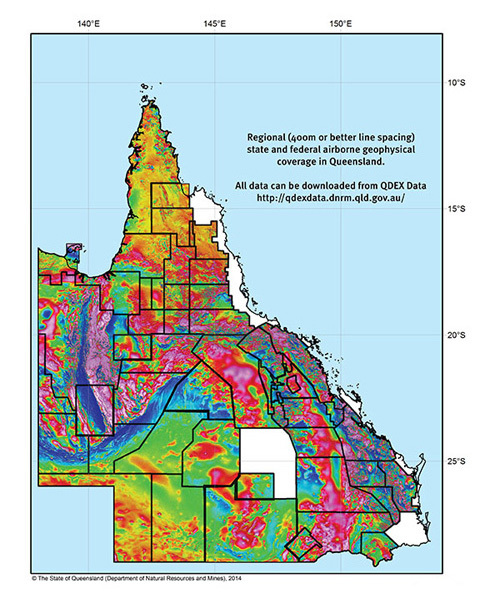 The below image shows coverage of the 400m line spacing or better regional magnetic and radiometric geophysical data throughout Queensland. GSQ conducts regional gravity surveys with a station spacing that is equal to or less than 4km. The collected data is then incorporated into the National Gravity Database. 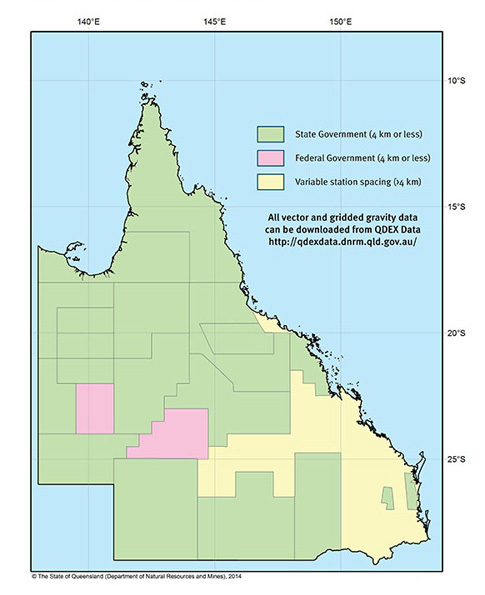 The image below shows coverage of gravity data and station spacing of surveys in Queensland. Deep seismic reflection surveys give a broader picture of the geological profile at depth as they are sensitive to different structural and petrophysical properties. The acquired data (in conjunction with rock properties and geophysical data) is enabling a much better understanding of the geology and mineral potential of northern Queensland. In 2006 to 2007, GSQ and Geoscience Australia (GA) conducted deep crustal seismic surveys across the Mount Isa mineral province, eastwards across the Carpentaria Basin and in the Georgetown and Charters Towers Provinces. In 2008, a magnetotelluric survey was performed over the same route. In 2014, a similar seismic and complementary magnetotelluric survey was conducted between Longreach and Four Ways in North-West Queensland. 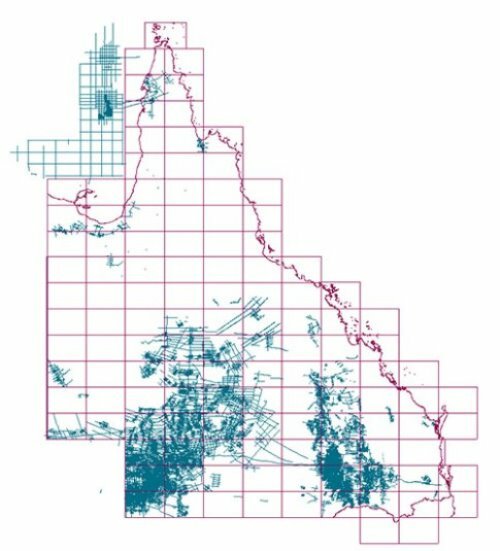 In the 2007 North Queensland MT survey, data was collected from a total of 116 sites and acquired along seismic lines 07GA-IG1, 07GA-IG2 and 07GA-CG1. The data was later reprocessed due to errors in sensor calibration and initial processing. In the 2009 Mount Isa MT survey, a total of 240 stations were collected along seven profiles. Three profiles are coincident with, or adjacent to, the deep crustal seismic section acquired by GA and the GSQ. The remaining profiles were defined to assist with interpretation of the Millungera Basin area, east of Quamby. 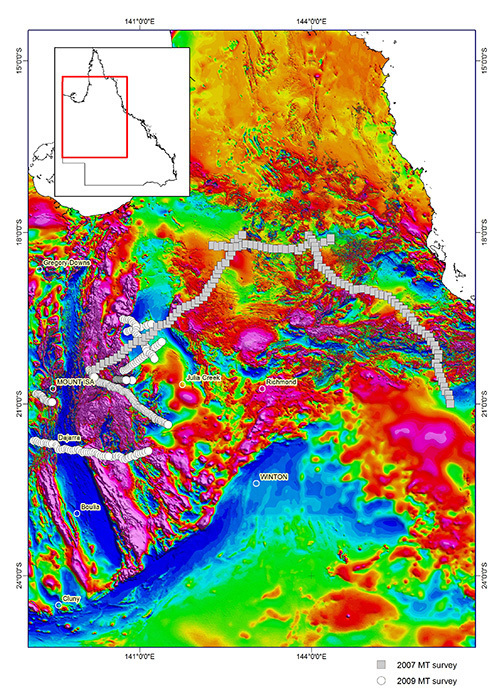 The image below shows coverage of GSQ deep magnetotelluric data in Queensland. Read about the Mount Isa magnetotelluric survey. You can download open file (i.e. publicly available) airborne geophysical data and ground geophysical data (including gravity) as Geosoft geodatabases and Geosoft grid files from QDEX Data. Contact the Mineral Geoscience unit of the Geological Survey of Queensland for more information.